Three years ago a handful of people with mental health problems took part in a creative writing course facilitated by poet Elspeth Murray. 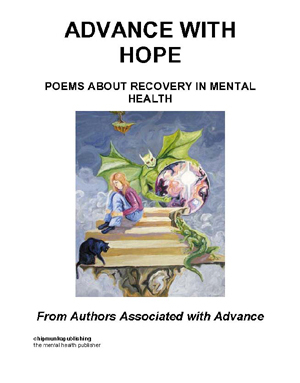 They, and other people supported by the national mental health provider Advance Support, have since produced an outpouring of creative writing to express their hopes, moods, fears and fantasies about recovering from their condition – which we have gathered together for the first time in this anthology. Feeling good, feeling down, feeling contempt for professionals – all user and survivor states are captured here. Advance is a national charitable organisation. We provide places for people with learning disabilities or mental health problems to live. We also provide support for them to live their lives the way they want, and advice for people seeking work or returning to work. Advance began as a not-for-profit organisation in 1974, working with a local Health Authority in Leicestershire to identify accommodation for patients as part of a large-scale discharge from a local hospital. Today Advance supports, houses and advises more than 3000 people in 33 counties across Central and Southern England. Experiencing mental ill-health or distress presents a plethora of problems and challenges. Being labelled as an individual with a ‘mental health problem’ presents even more. The world seems full of questions rather than answers, riddles rather than solutions. 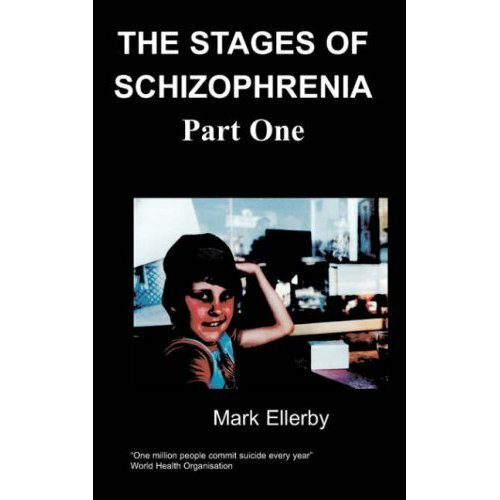 In 2007 Advance Support began exploring ways that people could strengthen their ability from within to solve these riddles and resolve some of these challenges, without relying on clinical intervention or medical diagnosis. We asked the question: What is important to your wellbeing and what factors could influence your recovery as individuals? The response was simple – my environment, my community and my place in it. Sort that out and I would not be in the mess that I’m in. Up stepped Teresa, an Advance tenant, who had written a poem about her experiences of community life and who thought this might help put things into context. The poem was titled Harassment, and you will find it in this anthology. Advance mental health service users have since produced an outpouring of creative writing to express their hopes, moods, fears and fantasies about their condition. Feeling good, feeling down, feeling contempt for professionals – all user and survivor states are here. Creative writing can help people highlight their experiences in a way that makes others listen and take seriously what they have to say – giving depth and feeling to the ordinary everyday struggles people encounter in their community. Writing poetry or prose is just one of the ways people can address one of the key problems they face in their lives: their capacity to recover and be a genuine part of their community, rather than being a stranger in it, and recovering from enduring an unwanted hospital admission and then having to return to their homes for another dose of alienation and exclusion once their hospital treatment was complete. But it’s just one plot on the map that makes up an individual’s recovery towards mental wellbeing. Our explorations into recovery have convinced us that the best approach to take is a panoramic view of an individual life and not just a life governed by a mental health diagnosis. This should be a pinprick in the landscape, not the very definition of who you are. We would like to say thank you to all those who offered their creative work for inclusion in this anthology. Some of the contributors have had their work published in print previously; others have never written creatively before. Several Advance tenants took part in a creative writing course facilitated by poet Elspeth Murray at the beginning of 2007; they have since gone on to perform their poems in public, and take a key role in Advance’s user-led Recovery initiative in mental health services, Safe Inside, Safe Outside (SISO). We would also like to express our gratitude to Elspeth Murray, who helped draw out people’s latent creative abilities, and who has contributed some of her own work to this anthology. And thanks to Chipmunka Publishing for putting the words into print.